What brand of eggs are they? I remember we used to get double yolks sometimes when we’d buy eggs from our neighbours — and because I love yolk, it made me very happy. I had to have ‘second breakfasts’ today. I woke up and did the toast thing, and then was hit with the most spectacular Monday Mood ever. I walked in this morning and declared that our business meeting would need to be held at a cafe that would bring me a bacon and egg roll. Somewhat lessened the grump factor. The yolk is definitely the highlight for me Beppie. I have ruined many a boiled egg in my efforts to get a lovely runny yolk. (I like a runny yolk but a still liquid white is a bit much). Oh, I know exactly what you mean — it’s so hard to acheive the Perfect Egg (but B&B owners tend to be very good at it). These days, I tend to fry my eggs, and then flip them for about two seconds to seal off the egg white that always lingers on top of the yolk. The main problem is, the eggs cook better in a non-stick frypan, but flipping them over is more difficult, because they tend to slip and slide all over the place, and it’s very easy to accidentally break the yolk that way. I once exploded a boiled egg. I didn’t understand the ‘why’ of don’t stick a boiled egg in the microwave. I thought the shell was the issue. So I boiled an egg on the stovetop and was REALLY looking forward to it. But when I chopped the top off the white was still a bit gross. So I stuck the top on loosely and popped it in the microwave for a short time. I sat down, started talking to my sisters and the instant I punctured the yolk sack there was a “BANG” and my face (and the wall behind me except for a rough silhouette of my head) was covered in egg bits. It must have looked hilarious to them – it was all very cartoon like. Yuumm…. that inspired me to make poached eggs (firm whites, runny yolks) on toast for lunch. We think eggs with twin yolks are very special in our house. I always call my Misses Seven over to take a look. Fuckpoliteness, reminds me of the time I decided to make fried rice, by taking raw rice, and frying it. We had a similar carton a while back – Coles ‘Barn Laid’ brand no less. . . 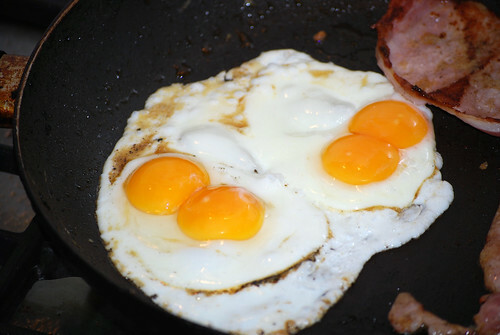 There used to be a guy at the Red Hill Market who sold cartons of double-yolkers – he said he knew because if a chicken that normally laid smallish eggs suddenly laid a great big one, it was a double-yolker. Tim T: a bit on the crunchy side huh? Still, no egg on *your* face! Frying raw rice is the beginning of a risotto. Or a biriyani. Or if you’ve boiled a chook, and you fry the raw rice and then cook it by absorbtion method (with some lemongrass and ginger) using the chicken stock, then eat them together, you have Hainan Chicken. Mmm yum, please to eat your cooking Helen? Now I am craving sticky rice. And is NOM NOM NOM the best expression ever? fp, your egg experience really made me laugh. Thanks. Oh it’s made my sisters and I laugh every time it’s mentioned. I do enjoy to share my i own idiocy for the sake of other’s mirth.